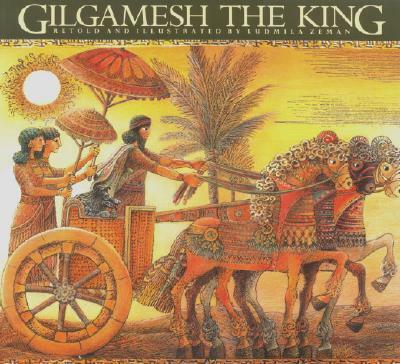 Gilgamesh, half-god and half-man, in his loneliness and isolation becomes a cruel tyrant over the citizens of Uruk. To impress them forever he orders a great wall to be built, driving his people to exhaustion and despair so that they cry to the Sun God for help. In answer, another kind of man, Enkidu, is sent to earth to live among the animals and learn kindness from them. He falls in love with Shamhat, a singer from the temple, and he follows her back to Uruk. There, Enkidu, the “uncivilized” beast from the forest, shows the evil Gilgamesh through friendship what it means to be human. Ludmila Zeman was born in the former Czechoslovakia and immigrated to Canada in 1984. She has taught art in Vancouver, created animated sequences for Sesame Street and, with her husband, made the film Lord of the Sky, an award-winning animated short. Her epic Gilgamesh trilogy won numerous awards. Her book, The First Red Maple Leaf, was a finalist for the Governor General’s Award for Illustration.